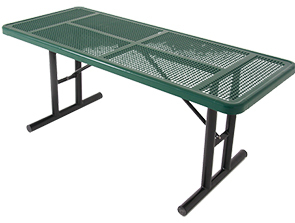 Utility tables are great for a variety of indoor and outdoor applications ranging from serving tables, athletic field side line tables to ADA compliant picnic tables. These all-steel classic 6' and 8' utility tables feature a sturdy perforated steel surface and convenient access to every side of the table. Supported by a 2-3/8"O.D. steel tube frame, MIG welded and powder-coated, the rectangular perforated utility table is a highly durable addition ready for high volume use.